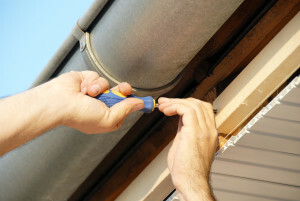 When choosing among gutter contractors in the Albuquerque, New Mexico, area, it can be hard to know who to trust. Thankfully, the team of factory-trained employees at ABC Seamless of Albuquerque has served the area since 1989, so we have the experience to expertly handle your gutter replacement job. ABC Seamless of Albuquerque’s gutters are custom cut on site to fit the precise dimensions of your home. That means you will never have to settle for pre-cut gutters that are susceptible to leaks, mold, or mildew. As your gutter contractors, we will provide you with a high-class product that is made from G-90 galvanized steel and blends in completely with your soffit and fascia system. Also, ABC Seamless of Albuquerque’s gutters are virtually maintenance free, meaning no painting is required – ever! Additionally, we are the only gutter contractors in the state with a machine capable of making a 7-inch seamless gutter that is typically used for commercial buildings, so you can count on us to install new gutters on either your home or your business. No subcontractors – Every employee has been background checked and drug screened, ensuring that only the best, most qualified, employees will be working on your project. Industry experience – Many of ABC Seamless of Albuquerque’s employees have at least 10 years of experience in the industry. Showroom – Our luxurious showroom is available Monday through Friday – or by appointment – for you to stop by and take a look at all of our products. Exceptional customer service – As your gutter contractors, ABC Seamless of Albuquerque guarantees that we will do whatever it takes to make sure you are happy with your project. For more information about hiring ABC Seamless of Albuquerque as your gutter contractors in the Albuquerque, NM, area, contact us today.